If you’re like me and enjoy devouring books, check out this cool website – it’s called The Prolific Reader. Fellow author Melanie Tomlin has set up a super handy site, filled with FREE books. 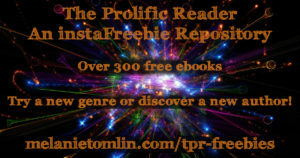 Unlike many of the free book promotions that you see, this is a site where the books are permanently listed as free on #instaFreebie. No time limits. You never have to worry about missing out on one of these books!